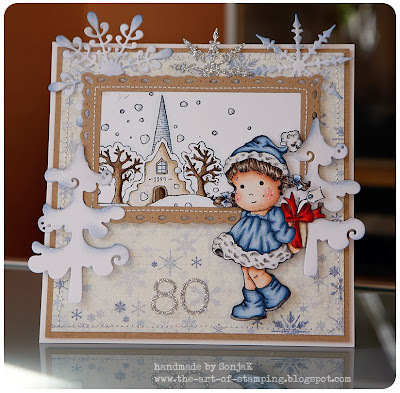 For my mother-in-law's 80th birthday I made the following card with the cute "Something For You Tilda". Endlich habe ich es mal wieder geschafft, eine etwas aufwändigere Cute-Karte zu gestalten, wofür mir leider meist die Zeit fehlt. Tildas Kleidung habe ich bewusst in Blau gehalten, damit die Karte nicht zu weihnachtlich wirkt. Das wunderschöne Hintergrundpapier stammt aus der "Vintage Winter"-Kollektion von Maja Design. Die Baumstanzen sind von Magnolia, die Schneeflocken von JoyCrafts. I eventually managed to make another of those wonderful but time-consuming cute cards. Unfortunately that doesn't happen often. Tilda's dress is kept in blue so that it doesn't look too much like Christmas. 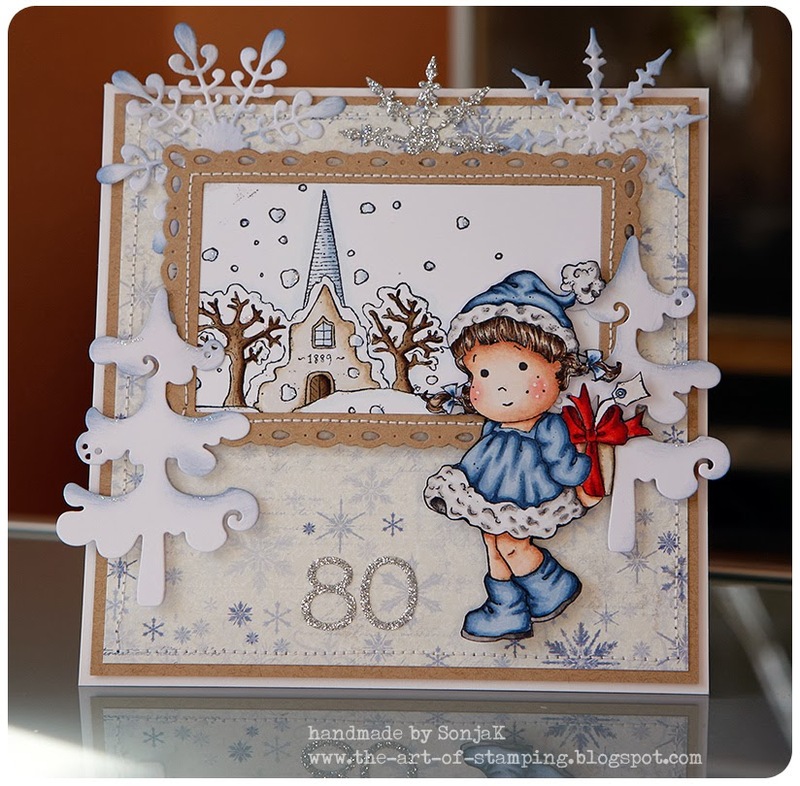 The beautiful patterned paper is taken from Maja Design's "Vintage Winter" collection. The tree dies are from Magnolia, the snowflakes are JoyCraft dies. Hier noch zwei Nahaufnahmen von der Koloration. Here's two close-ups of the colored motifs. 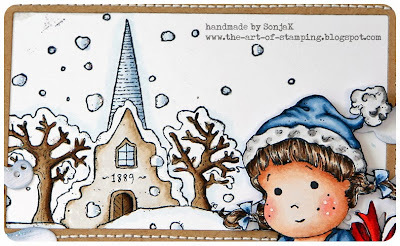 Stempel: Magnolia "Something For You Tilda", "Old Swedish Church"
Stempelkissen: Memento Tuxedo Black, Distress Ink "Faded Jeans"
Motivpapier: Maja Design "Vintage Winter"
Stanze: Magnolia "Spruce", Spellbinders "Romantic Rectangles", Memory Box "Typewriter Numbers", Joy Crafts "Snowflakes"
Such a beautiful card for your MIL!! I bet she loved it! Thank you so much for joining our challenge at MDUC - Anything goes. I wish you a very Happy New Year, and hope you will continue to join our challenge the coming year.